As I continue my meditation practice, and especially while traveling, more insights came to me about what meditation is and is not. It can be a bit challenging to keep up a regular practice while traveling, and a key concept is to not judge yourself. 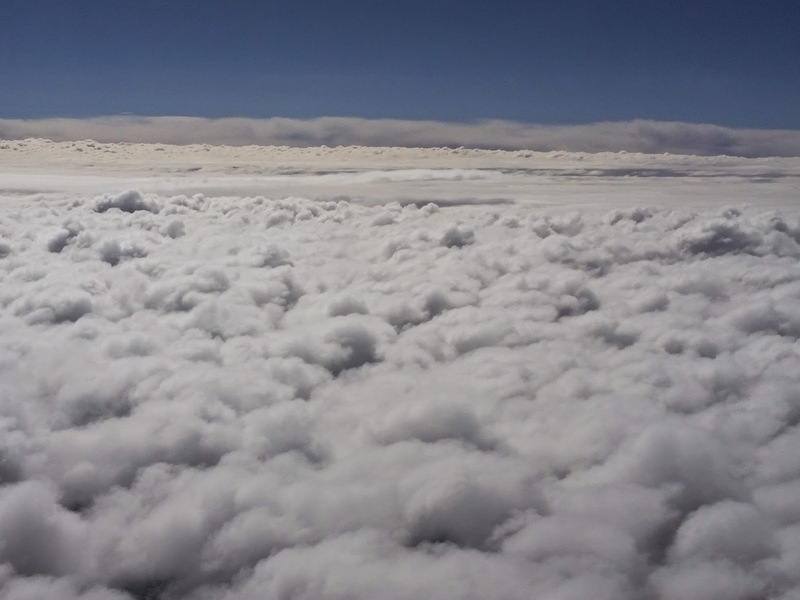 Travel is glorious and disruptive at the same time, so the idea is to do the best you can to stay “grounded”, and meditation can help in this area. I recently had a conversation with someone who said she hadn’t been able to commit to meditation, even though she thinks it’s probably pretty great, because she doubts if she can clear her mind of thoughts. I think that’s a common misconception. Maybe advanced meditators can do that, but that is definitely not my experience! Someone else I talked to said “I’ve just got to keep doing it until my mind goes!” She seemed to be trying too hard. It’s not about the mind going somewhere else, or having no thoughts at all. Back when I was a conservative fundamentalist Christian I had a long list of things that were bad, or even evil. Meditation was one of them, because the belief was that you make your mind blank and as a result you open yourself up to evil spirits who can come in and possess you. I really believed that, which now amazes me. Back then, I embraced dogmatism rather than allow uncertainty into my life. I am happy to report that I was wrong, and if I can meditate, anyone can. One way to experience meditation is to realize that it is basically sitting with yourself. There are different techniques, and although it is helpful to have a teacher, it is not absolutely necessary. I use a mantra based on when and where I was born. The mantra is an anchor, or you can use your breath. I focus on it, but inevitably my mind drifts to — you got it, thoughts! Then after a bit I realize I’m thinking, so back to the mantra. There’s no striving, just gentle drifting back and forth. Definitely not blankness, but occasionally there is an awareness of being somewhere else, so to speak. It’s difficult for me to describe. And I must admit that I sometimes relax so much that I nod off to sleep! It is worth it to make a commitment, to take the time, to truly sit with yourself and to allow whatever is inside you to surface. Then you get up and go about your business. Over time, you will see a difference in your responses to life’s frustrations, and people will say, what have you done with yourself? Because you will develop a different countenance and demeanor. This huffington post article about the benefits of meditation is fascinating, and has before and after pictures. As you practice sitting in meditation letting whatever happens inside happen, without judgment, you will gradually find yourself letting go of old mental and emotional patterns. You will find freedom from that which doesn’t serve you well, and you will find new ways of peacefully embracing life as it unfolds. Today I head home. Rachel and Geoff left for church around 9:30, and I departed shortly afterward. The train that was passing when I left was a double decker, which stopped for a few minutes, then started backwards. I wonder what that was all about. I decided that I couldn’t leave town without visiting Cafe Diem one more time. Their coffee is really good, and I wanted another waffle. It is a good place to hang out and write. I had originally thought to drive into Des Moines and find a coffee shop there, but the warm and friendly atmosphere here beckoned me to come inside. The city was founded in 1864 as a station stop on the Cedar Rapids and Missouri Railroad and was named after 19th century U.S. Congressman Oakes Ames of Massachusetts, who was influential in the building of the transcontinental railroad. Ames was founded by local resident Cynthia Olive Duff and railroad magnate John Insley Blair,near a location that was deemed favorable for a railroad crossing of the Skunk River. Ames is also the home of Iowa State University, whose campus takes up a major part of the city proper, and whose mascot can be found around town in various attire. This mirror mosaic version on Main Street is my favorite! I love to take back roads, when I have time, so I took the opportunity. Miles and miles and miles of newly planted cornfields flew past me. I marveled at the wide open spaces, and the big sky. Very mind clearing and heart opening. Along the way, I got a phone call that my flight was delayed 45 min. So I got here with time to spare, still feeling pretty relaxed. Announcement overhead: They need 12 volunteers to check their carry on bags or they will check boarding group 4’s bags. I’m in boarding group 4, and I want to hang on to my bag! If I didn’t have a connection I’d check it, but I don’t trust the airline to care about my stuff and get it moved to the right plane. Another announcement: The flight is overbooked and they need 6 volunteers to take a later flight. Are you kidding me? Does this happen all the time? Seems crazy to me. What do they do if no one volunteers? Draw straws? Now at Dallas Fort Worth Airport…. No rushing this time. Google just notified me that my connecting flight is delayed 2 hours!! Obviously, I made it onto the plane and they didn’t confiscate my bag. I was imagining myself wrestling someone over it, and am very glad that fantasy didn’t come to pass! I had a window seat this time, so I got to see the farmland from the air, and later the beautiful changing clouds as we flew above them. I was very hungry when I got here, glad for some time to rest and recoup. I got a veggie burger at a place called UFood Grill. It had to be the worst veggie burger ever. I only ate a few bites, but the baked potato fries were a little better, so I ate enough of them to ease my hunger pangs. Airport food, yuk. By this time I was feeling very imbalanced, shaky, and tired. So I decided to sit right there in the middle of the busy airport and meditate. I wrapped my silk shawl around me (I had read that silk can keep negative energy away), put one hand on my suitcase, closed my eyes, and went inward. It was an interesting endeavor, and 20 minutes later I opened my eyes feeling more grounded and alert. Checking google on my phone, I found that my flight is delayed even more, not leaving here until 10:12 pm, arriving in Houston at 11:30. Then I have to get my car, and drive the 30 min home. I again observe the people around me. Young, old, all shapes and sizes, some rushing frantically to catch their next flight, others taking their time, or just sitting. People on their phones. I wonder about their stories. I see a team of adolescent girls all dressed alike, most likely returning home from a tournament . There are couples, friends, family groups, lone travelers like me. Some are traveling for a happy visit, or a wedding, some for a funeral. This is an international airport, so I see a diverse crowd and hear snatches of different languages. The masses of humanity are everywhere. Tomorrow I return to work, to the patients and coworkers who are a part of it all too. Everywhere there is life, hope, and heartbreak. I am glad to be on this journey, one soul touching other souls. The plane didn’t take off from Dallas until midnight. Delay after delay until I was too tired to care, or write, or even sleep. I finally got home to my sweetie at 2 am! 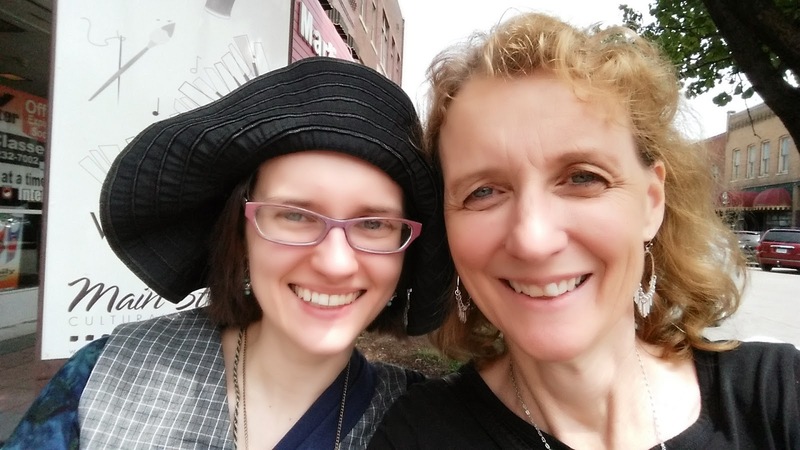 I am very glad I made this trip, and reconnected with my daughter. It’s been a long time since we had one on one time. My sleep wasn’t as sound as the previous night, and the couch seemed lumpier. I’m not sure if the gray of dawn woke me, or the rattle of the freight train. The sound of a train is unique.. after it passes by, there is a trail of sound that follows, fading into a low sigh. I enjoyed some quiet time, then fixed a breakfast of stewed apples and fried eggs. The temperature was in the upper 60’s and lacking the humidity of back home, so I took a morning walk down to the water tower and back. I love experiencing new places on foot – there is always so much to see that is often missed in a car. Discoveries today included a very realistic statue of a dog in a flower garden and a front yard that was completely converted into a vegetable garden. I wonder about the people behind the walls, each with their unique experience. I walk past a school and a cemetery on my left, and apartment buildings on my right. I see maple trees, lots of evergreen trees, a chipmunk! and the water tower, which is one of those great ones with legs that you can stand under. The grass in the field is the soft kind, that I would have loved to lie down in and roll around in. The dampness of it kept me from making a spectacle of myself! 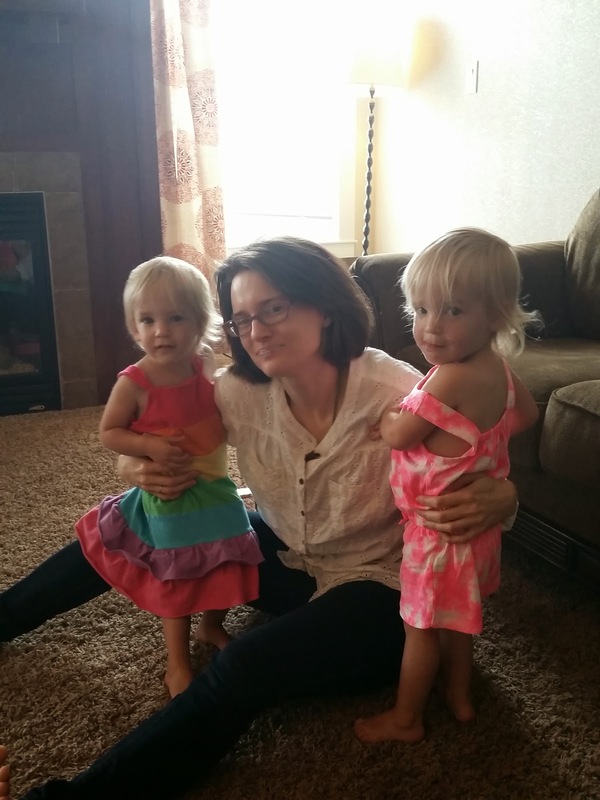 The rest of the morning was spent visiting Rachel’s good friend Christi and her three daughters – a 4-year-old and identical twin 2-year-olds. Rachel is their godmother, and they were very happy to see her. One of the little ones even warmed up to me. I had seven children, but can’t imagine the energy it would take to have two babies at once! I enjoyed the drive there and back through Iowa’s famous farmland, and the visit was fun and relaxing. After another lunch in a cafe called The Cafe, I took Rachel home to take care of some business things she needed to attend to, and set off on my own. My destination: Reiman Gardens on the University of Iowa Campus. 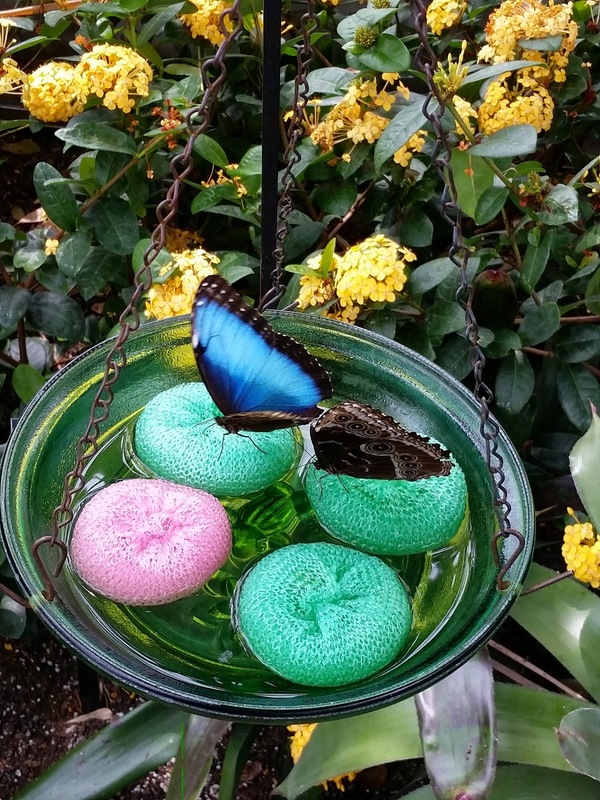 My favorite part of the place was the small butterfly observatory, the most plentiful and very beautiful butterfly being what I later identified as the common blue morpho. I enjoyed an afternoon walk through the gardens but it was a bit early in the season for flowers, and it got very warm, up near 80. 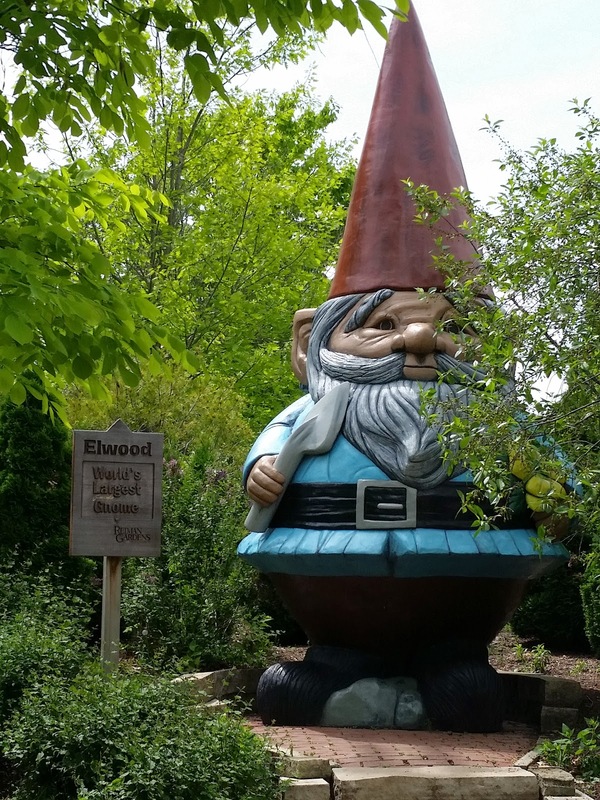 The most interesting thing I found there was a statue of “the world’s largest gnome”! I went back to the Main Street area to see if I’d missed any good stores there, and found Random Goods, which I highly recommend if you like vintage clothes and jewelry. They had other odds and ends of old dishes and miscellaneous, too, and I bought a bracelet, a scarf, and several tops, for less than $15 total! I love vintage stores and clothes! I made one more stop – Wheatsfield Cooperative, the natural food store. I wanted to see if I could find a healthy snack for the plane ride, and I found it. They have a wonderful bulk section, and I was like a kid in a candy store. Only the fact that I have one small suitcase kept me in check! I got cashews, chocolate chips, and cranberries to make my own trail mix, and a small bag of loose licorice root for tea. I certainly got in plenty of walking today, which is something I want to keep doing when I get back home, in preparation for my Montana trip in two and a half weeks! It was nice to get back to Rachel and just hang out for the rest of the evening. I had had such a large lunch that I opted for tea and toast for supper, and enjoyed the Chocolate Peppermint tea that I had picked up along my journeys. We wrapped up the evening with Starship Troopers, which neither of us had seen. Both of us enjoy sci-fi, and I especially like the cheesy type. This movie, made in 1997, is based on a 1959 Robert Heinlein book. I was an avid Heinlein fan back in the 60’s and 70’s, and the movie was well-done and enjoyable. The best kind of movies are the ones that make you laugh and also have scary tense moments, and this one didn’t let me down. Settling down for my last night here, a light rain was falling, the freight trains kept running, and I felt a deep sense of satisfaction. I woke to the sound of the freight train across the street. I love the sound of trains. I slept surprisingly well, considering I was away from home and on a couch. Travel can wear you out. I checked my phone for the time: 5:07, about normal for me. 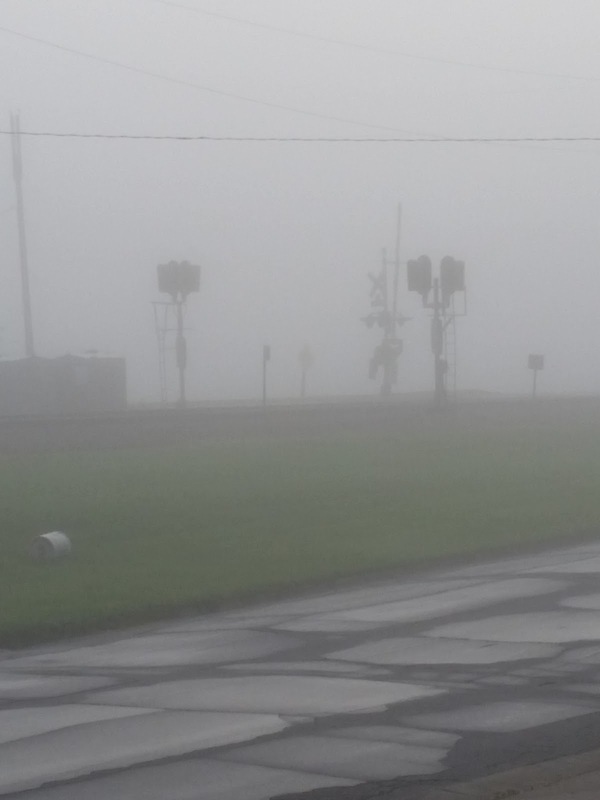 Dense fog advisory. Nice, means it is warming up a bit. I knew I wouldn’t see Rachel for a while, as she has never really been a morning person. So, after my morning meditation, I drank some Raja’s cup while catching up on social media and writing, enjoying the sounds of the trains, of which there are many. More than I could ever imagine. At 8:20, finally satisfied with my blog post, I decided to venture out for food, as there was still no sign of activity elsewhere in the house. I came out of my reverie and found myself on the campus of Iowa State University. I decided to look for another place rather than find myself at some college hangout, so pulled over and checked the GPS. This time I chose Cafe Diem, and here I sit. It is on Main Street, and it is one of many intersting looking businesses in this restored old downtown area. 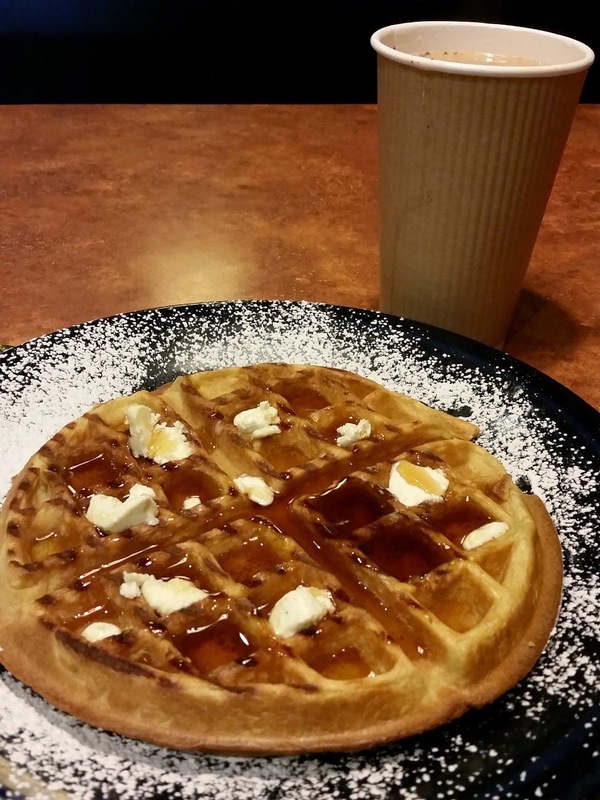 I enjoyed a Belgian waffle with butter and syrup, and am sipping a cup of excellent coffee with cream and nutmeg. When I got back to Rachel’s she was up and around and we decided that the day would be well spent down on Main Street. She’s only lived here a couple of years and hasn’t been in all the stores. After we got back to the area, we walked past several beautiful old church buildings. I love looking at old buildings, inside and out. They are generally more interesting than new ones, and better built as well. We lingered there for quite some time, talking about our individual spiritual journeys. 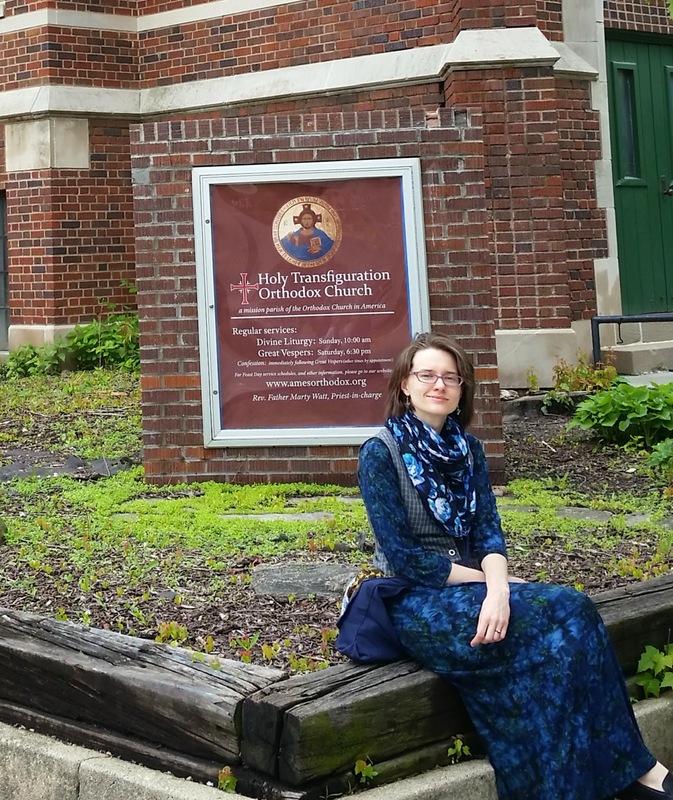 Her childhood and adolescence were spent in conservative evangelical churches, and in college she found her way to the Orthodox Church and loves it. And I, the one who raised her in the evangelical church, have found my way out of church completely, and feel closer to God than I ever did inside the building. I am very happy that we had that moment, and the best thing is that there is no judgment or trying to convince the other. We each have our own path. The rest of the afternoon was spent browsing in a couple of great shops. 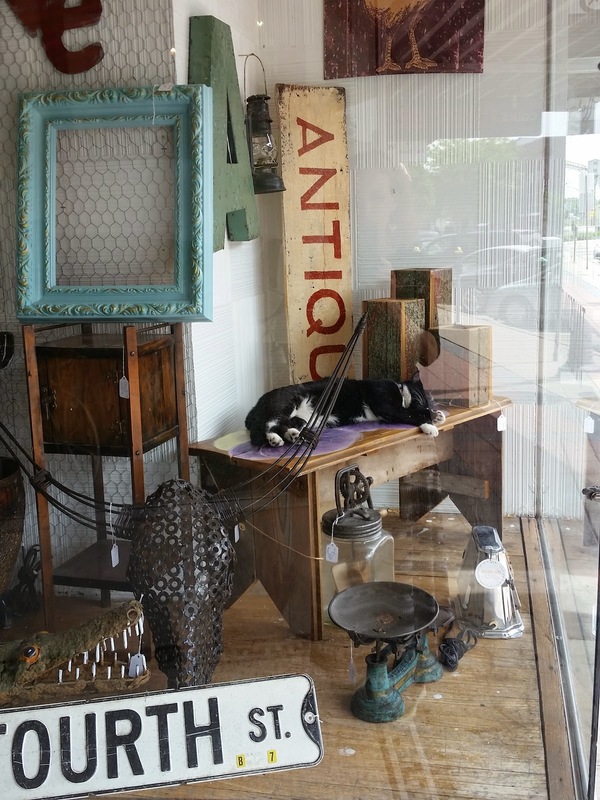 Worldly Goods is a wonderful fair trade outlet, with beautiful handcrafted goods from third world native artisans. I didn’t really plan to buy anything, but sometimes things just jump out at you and you have to get them, you know? So I bought myself a ring and a beautiful purple tunic. I love the style and purple has been calling to me lately. Next door to that we found a unique antique store called Tangerine Zebra. That is a cool name for a store, and I do wonder where it came from. So many treasures inside! Jewelry and buttons and kitchen gadgets and toys — oh what is that up there? It is a cast iron horse-drawn fire wagon. 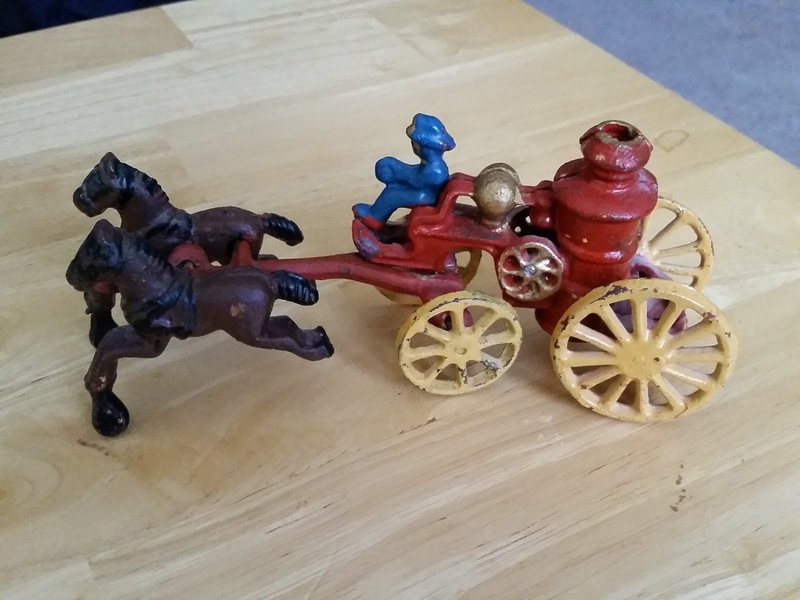 I had to get it, to go with the cast iron horse-drawn ice truck I already have. I suppose that I have a collection now. Rachel found a pretty necklace watch, and we left there feeling quite content with our purchases. The rest of the day we just hung out – resting, reading and what-have-you. We ate take out Thai food for dinner, and called it a night.